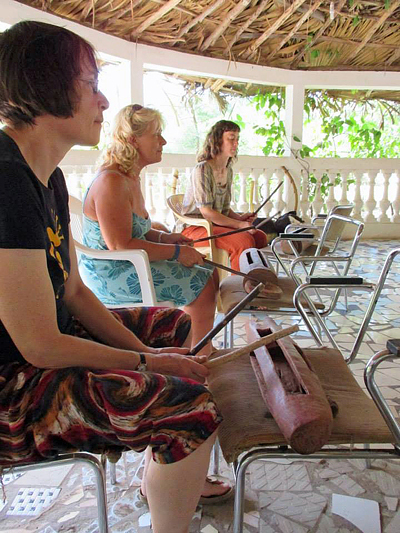 In the Gambia, with its rich mixture of tribal groups, you’ll find a wonderful variety of musical traditions. In the hotels and restaurants, mirroring the celebrations that take place at naming ceremonies, weddings and parties, it’s possible to see a range of music from the Jolla, Wollof, Mandinka, Serahuli, Fula, Serer and Aku tribes with influences from Guinea, Sierra Leone, Senegal and many other parts of West Africa. Inevitably there is some blending of traditions and fusion of styles and instruments. And while some instruments are specific to certain tribal groups or countries, others are more universal to West Africa as a whole. One of the latter is the krin, otherwise known as the log or slit drum. What is the krin and where does it come from? The krin is an idophone; an instrument which creates sound by the whole thing vibrating (as opposed to having one part of the instrument, such as the strings, vibrate). It’s sometimes also known as kolokolo, lokole, kreen, kreenyi, korokoto or krinyi in West Africa (plus probably a whole load of other names I don’t know). 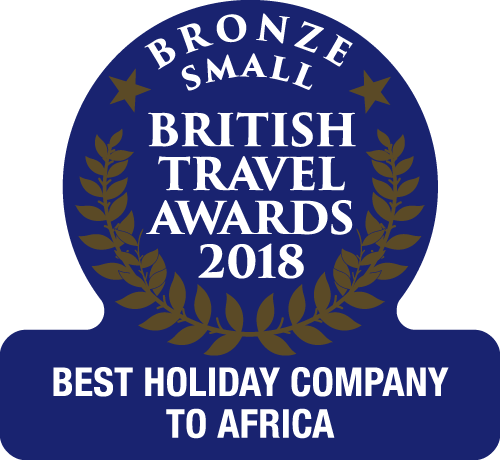 It is found not only across most West African cultures including The Gambia but in many other places around the world, from Polynesia to Russia. It seems to be almost culturally universal albeit with some variations. It’s safe to say that the krin is very ancient indeed. There seems to be plenty of evidence of such drums from the 6th century if not before. Many Native American cultures used slit drums called teponaztli. The Aztecs also played them and they have been present in Polynesian cultures for a long time. In West Africa krins seems to have been originally used for two purposes. Firstly long-distance communication; these were often strategically sited along a river or a valley for optimal acoustic transmission. Secondly they were used for various village ceremonies. How is the krin made? The krin is made from a single log or piece of wood or bamboo (or occasionally a human bone). It’s basically a carved out hollow cylinder, a ‘box’ with one or more slits in the top. Sometimes these are in the form of an H or they can simply be cut as horizontal lines (as in the photo above). The bigger the log, the louder the sound. After the wood is carved out, the drum can be tuned to produce at least 2 different pitches. The thickness of the wood also varies the tones when the drum is struck with sticks or mallet-like beaters usually made from the same wood as the drum itself. It’s very hard work to make one and great skill is required to get the tuning right; the relationship between the slits and the tongues or keys of wood left on the krin makes the difference between one that sounds wonderful and one that just sounds ‘dead’. Like a lot of West African instruments, krins tend to improve with age as the tonal qualities of wood improves with time. There’s an interesting article on how log drums are made in ‘Natural History Sept 1942: “Drum Talk is the Africans’ ‘Wireless’ “ by A.I Good. The krin can be placed on a stand to improve resonance and they can be very large indeed. 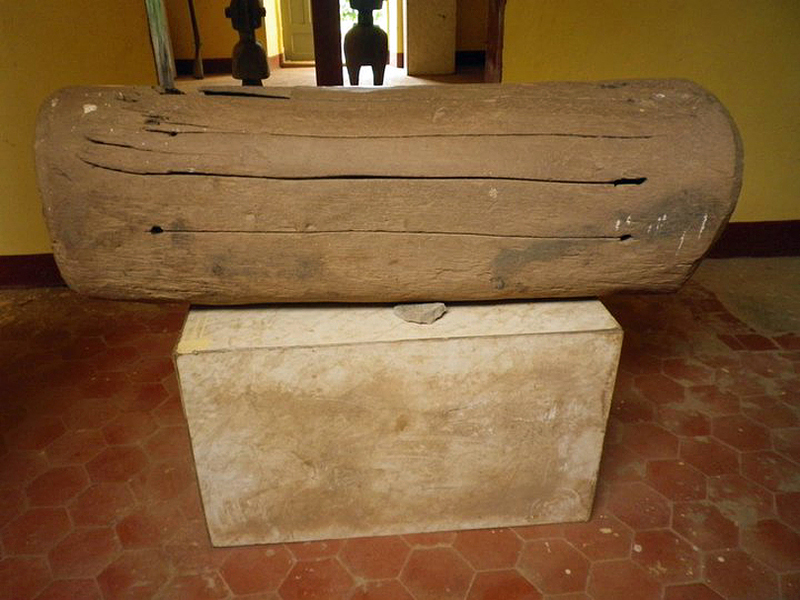 In the museum in Boke, Guinea, (which is located in a former slave fort) there is a very old krin which has eight different notes (pictured above). The guy who showed it to me spoke very little French and no English, while sadly my Fuller isn’t up to much, so that’s all I know about it. Typically nowadays there are two tuned keys and three slit openings, sometimes with a handle on one or both ends. This gives two main notes but the whole thing is generally played offering a huge variety of pitches and timbres and skilled players can produce an amazing range of sounds. Playing styles vary but either musicians sit on the floor, crossed-legged, with the instrument on the floor in front of them, or (and this seems more recent and associated with the performance tradition) stand up with it supported on a plinth of some kind. Generally krin are played in musical ensembles. The first performing troupes or ‘ballet’ troupes as they are known, developed in Guinea from the 1950’s popularised the krin alongside other instruments such as the balafon, bolon and kora. Les Percussions de Guinea and Les Ballets Africains both used krin. 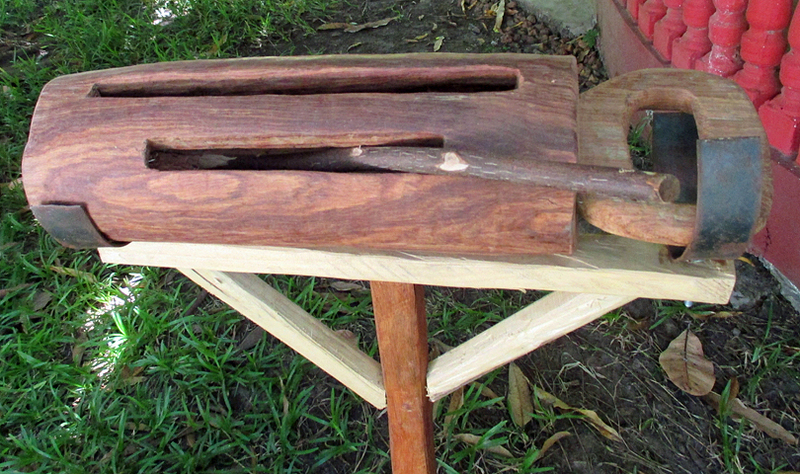 Often a piece is begun with a krin ‘call’, demonstrating the carrying power of such an extraordinarily instrument. Occasionally a whole piece is played with them – a stunning example being on the DVD Les Genies de Djembe by Les Percussions du Guinee which incorporates quite a bit of krin playing and where one of the pieces opens with an outstanding set of some of the female musicians playing just krins. Here. in another style, using lower pitched instruments, Baga Fote, a young Conakry based ‘ballet’ troupe perform a whole piece with krins. The krin is now growing in popularity outside of West Africa, as can be seen by the variety of videos now published in YouTube. Guineans including Amara Kante, who played with Les Ballets Afracains de Guinea and Les Mervelous De Guinea, started the Kawafoli school of Manding Percussions in Marseille where he plays and teaches krin. Other famous players include Bolokonda Conde (seen below) and Ibrihima kolipe Camara. The Cardiff Based Ballet Nimba use the krin in their performances in much the same way as the original performing troupes from Guinea.